Medicinal and other uses: Flowers used to treat colds and catarrh of the upper respiratory tract and hay fever. Dried fruits or fresh juice are used as an analgesic, diuretic, laxative and diaphoretic in cases of feverish catarrhal conditions. Flowers used in herbal teas and remedies, and for light alcoholic beverages. Berries are used as a natural coloring agent in food products. Yellow and violet dyes can be made from the leaves and berries. 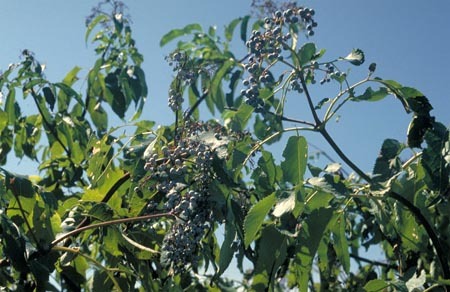 Cautions: It is best to eat cooked ripe berries rather than raw. The roots, stems, and leaves are said to contain cyanogenic glucosides which are substances that release cyanide, care should be taken when ingesting (Kowalchik 178-9).